The Bears wrapped up day seven of training on Friday, which means — drumroll, please — that they are halfway done with fall camp. Kunaszyk can be seen sprinting to every drill on the field and is more than likely the first guy taking a rep. The veteran leader isn’t as rowdy as the corners or much of the secondary — he’s more of a silent assassin. “We’re going to go through adversity in camp, we’re going to go through adversity in the season, so it’s important that we persevere and that we … go hard and fight through our tough times,” Kunaszyk said. Kunaszyk and redshirt junior Gerran Brown could very well be the two inside linebackers to get the green light come Sept. 1. At outside linebacker, it would come as little surprise to see redshirt sophomore Cameron Goode and senior Alex Funches line up as starters. From setting the edge to providing a real threat in the pass rush, Goode and Funches are both athletic guys who can be big playmakers for the Bears. Goode, who racked up three sacks on day six of camp, showcased just how handy his large wingspan and reach can be. No promises that the really bad puns about redshirt senior wide receiver Moe Ways will cease. 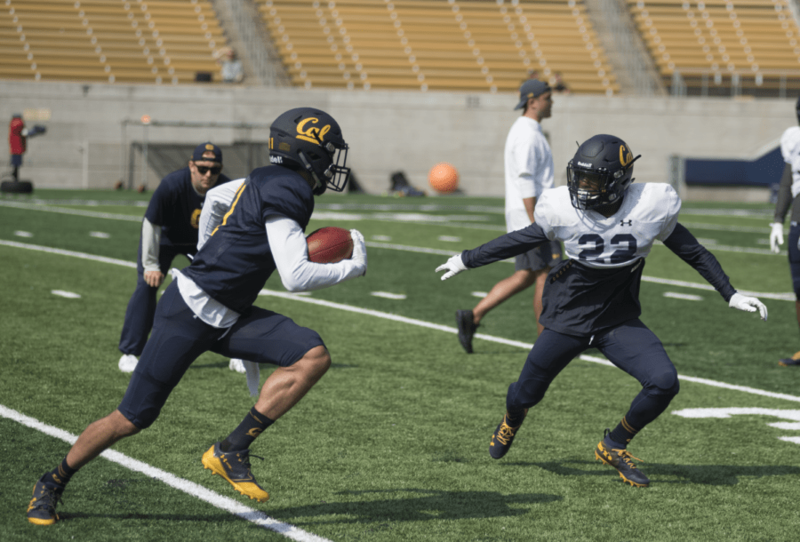 Right out of the gate, Ways has established himself as a serious potential weapon for Cal. After every practice thus far, he has stuck around on the field, getting in extra reps and proving that he is hungry to make plays. The veteran receiver out of Michigan has great hands and has fared well against Cal’s best cornerbacks, coming up with several impressive catches throughout camp. Perhaps the most startling aspect of Ways’ play is his potential. “He can be better, there’s no doubt,” Wilcox said. Another new face at the position is freshman Nikko Remigio, who hails from Mater Dei High School and has gradually been making his presence known. With redshirt junior Kanawai Noa and redshirt senior Vic Wharton III not in the full swing of things just yet, both Remigio and Ways have received far more reps and chances to shine. Redshirt junior quarterback Ross Bowers noted that Ways and junior wide receiver Jordan Duncan have really set the tone at the wide receiver position. Don’t be surprised if Bowers finds himself targeting Ways or Duncan if he is driving downfield or looking to heat up in the red zone. Bowers appears to own the starting spot, with four other gunslingers gunning for it — maybe next year the battle will be more cutthroat. The competitions that are developing at the cornerback and safety positions, however, are far more enticing. The Bears have solid depth at the cornerback position, with sophomore Elijah Hicks and redshirt sophomore Camryn Bynum putting up impressive outings in the first seven days. But as a group that can be seen staying after practice and working together, the cornerbacks are getting better and better as a whole. Players such as freshman Chigozie Anusiem and juniors Josh Drayden and Traveon Beck will look to fight their way up the depth chart. At safety, the redshirt junior combo of Jaylinn Hawkins and Ashtyn Davis seems to have the edge, but overall, the position features a versatile and interchangeable core. Redshirt sophomore safety Evan Rambo is coming off of an injury from 2017 but has had a prolific showing in the first week of fall training. He is the tallest of the safeties and will give defensive backs coach Gerald Alexander a lot to consider come the finalizing of the depth chart. Along with being an apt dancer, Alexander is undeniably one of the most popular coaches on staff among his players. Alexander has taken the secondary leaps and bounds past the expectations that anyone held it to just a few years ago. From his energy — which bleeds into players — to his work on the field, Alexander is working to develop his secondary into a trustworthy group that will look to silence receivers down the stretch. Seven fall camp days down, seven to go, with action resuming tomorrow.